Ingredients: Sodium Bicarbonate, Citric Acid, Sodium Carbonate, Popping Candy, Cream of Tartar, Sodium Laureth Sulfate, Lemongrass Oil, Bergamot Oil, Rosewood Oil, Lauryl Betaine, *Citral, *Geraniol, *Limonene, *Linalool, Perfume, Colour 42090, Colour 45350, Colour 19140, Frosty Holley Lustre. Lush Times magazine: Every Christmas needs a cracker! Crackersnap is a new, cheery, lemongrass Bath Bomb that ‘cracks’ wide open in your tub, turning the water bright green and revealing a few extra treats – just like a real Christmas cracker! Pop on your party hat, tell yourself a joke and round up that crocodile for future bathing fun times. Review: This has the wonderful “Avobath” scent, with lotsof lemongrass and bergamot. It makes popping sounds as it dissolves. They were fragile via mail order but then Lush started putting them in little plastic cases and that’s why mine was not broken when it arrived all the way from England. 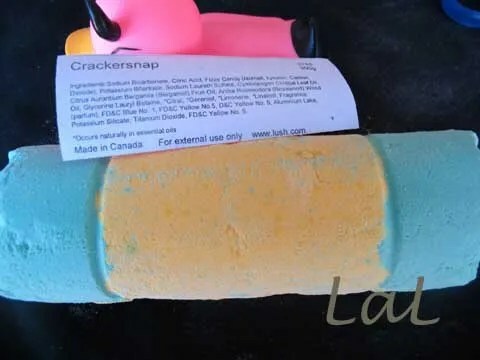 Here’s a demo i recorded of the Crackersnap bath bomb in the tub. Posted on September 3, 2015 by Lushalot	• This entry was posted in Bath Bombs, Christmases Past and tagged avobath, green and yellow, holiday lush, new years, popping candy, scent family. Bookmark the permalink.